Ultimate Fighting Championship (UFC) Strawweight scrappers Bac Rawlings and Jessica-Rose Clark collided last night (Nov. 18, 2017) at UFC Fight Night 121 inside the Qudos Bank Arena in Sydney, Australia. Rawlings’ UFC career as a whole has been a bit disappointing. As is often the case, Rawlings sought a fresh start by switching weight classes, and this was her first attempt to make it work. For what it’s worth, she did look far happier and healthier at the weigh-ins. Clark, on the other hand, missed weight, which was actually understandable for once. This stood as her first fight at 125 lbs., and she accepted it as a short-notice replacement. Regardless of the circumstances regarding weight classes, both women walked into the cage ready to throw down. Rawlings opened with pressure, looking to jab her way inside and throw combinations. Clark circled and countered, but a naked low kick allowed Rawlings an easy takedown. Clark reversed quickly then was nearly caught in an arm bar. Clark controlled for a decent amount of time but didn’t do anything significant. Rawlings returned to her feet with 90 seconds remaining, going on the offensive and walking forward. However, it was Clark who landed the better shots, countering Rawlings’ forward movement by suddenly bursting in with heavy shots. It was a clear round for the debuting fighter. Rawlings continued to charge forward into the second, pushing into a body lock along the fence. The two fighters traded positions along the fence for a few moments before returning to the center, where Clark ripped Rawlings up with strikes. A knee to the body backed Rawlings up, and follow up punches created an easy takedown opening for Clark. Clark attempted a head-and-arm choke immediately. She wasn’t able to land the choke, but she did end up in mount. Clark finished the round there, picking her moments to drop elbows into Rawlings’ skull. Rawlings came out with even more aggression, showing the appropriate amount of desperation considering her situation. Despite that, Clark did a fantastic job of angling off, making Rawlings miss and slamming her with kicks on the way in. Rawlings certainly landed some of her own punches, but Clark was the far superior striker on a technical level. That said, there’s something to be said about raw aggression, as Rawlings stunned her foe with a left hook and right hand. Clark clinched up to recover but wound up on her back. Her head cleared up quickly, as Clark reversed position and finished the bout on top. Somehow, the judges could not unanimously agree, but the correct woman’s hand was raised. Start to finish, this was really a great performance from Jessica-Rose Clark. Her striking really looked excellent, as she out-maneuvered an aggressive fight intent on throwing volume. To be frank, Clark made her foe look bad on the feet, switching directions and escaping almost at will. Additionally, Clark showed a great diversity in her striking. She jabbed well, landed lots of right hand counters, kicked out the legs, and even stunned her foe with a step knee to the mid-section. It was a well-rounded show of kickboxing, as Clark excelled wherever the fight went. Furthermore, Clark’s wrestling and jiu-jitsu looked solid. Rawlings isn’t the best on the mat, but Clark won all of the grappling exchanges and most of the wrestling ones. If she can manage the weight cut — given a full camp, she’ll have a better shot — Flyweight has a new contender. Strawweight or Flyweight, Rawlings’ problems continue. She’s tough and game as hell, but the fact remains that she’s just not that great in any one area. Her best skill is boxing, but she was thoroughly picked apart by a newcomer in this match up. She tried to grapple and switch it up, but that didn’t play out any better. Following this loss, Rawlings’ professional record is 7-7. Her UFC record (2-5) isn’t much better, and she’s now lost three straight. There’s a real chance she’ll be released, but her possible saving grace is being a member of a brand new division. 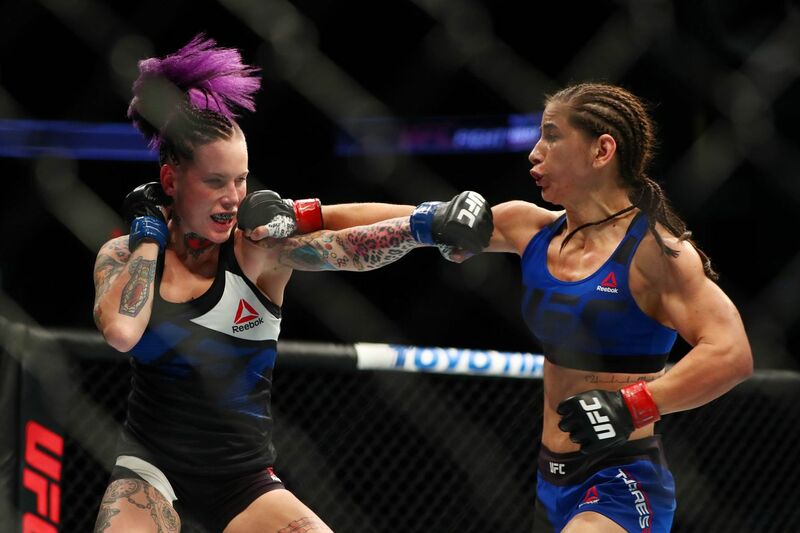 Last night, Jessica-Rose Clark put forth a great performance to win her UFC debut. Who should Clark face next? For complete UFC Fight Night 121 “Werdum vs. Tybura” results and play-by-play, click HERE!